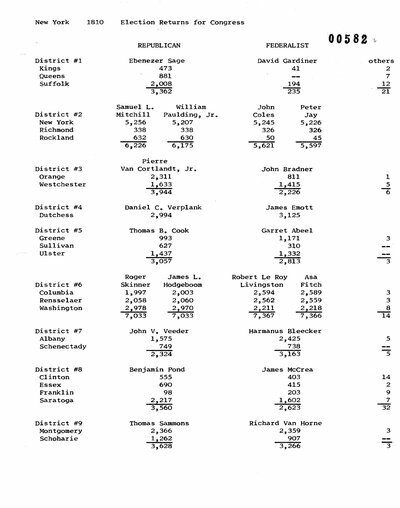 Pierre Van Cortlandt, Jr. received 246 votes as Pierre Van Cortlandt, 1 vote as Pero Van Cortlandt and 1 vote as Philip Van Cortlandt. John Bradner received 39 votes as John Broder and 24 votes as John Brader. Daniel D. Tompkins and Jonas Platt were candidates for Governor. John Broome and Nicholas Fish were candidates for Lieutenant Governor. Richard Hatfield and Ebenezer White were candidates for State Senator. Abraham Odell, Robert Graham and Benjamin Isaacs were candidates for Assembly. "The following statement shows the result of the Congressional election throughout the state...MAJORITY...7th Con. district. Westchester and Orange,-- Pierre Van Cortland[sic], Junior 1779." The Advertiser (Ballston Spa, NY). July 10, 1810. Pierre Van Cortlandt, Jr. received 98 votes as Pierre Van Cortlandt. Pierre Van Cortlandt, Jr. received 16 votes as Pierre Van Cortlandt. Pierre Van Cortlandt, Jr. received 11 votes as Pierre Van Cortlandt. Pierre Van Cortlandt, Jr. received 8 votes as Pierre Van Cortlandt. Pierre Van Cortlandt, Jr. received 3 votes as Pierre Van Cortlandt. Pierre Van Cortlandt, Jr. received 33 votes as Pierre Van Cortlandt. Pierre Van Cortlandt, Jr. received 24 votes as Pierre Van Cortlandt. Pierre Van Cortlandt, Jr. received 148 votes as Pierre Van Cortlandt and 1 vote as Pero Van Cortlandt. Pierre Van Cortlandt, Jr. received 10 votes as Pierre Van Cortlandt. The Albany Register (Albany, NY). May 4, 1810. Utica Patriot (Utica, NY). May 8, 1810. American Citizen (New York, NY). May 12, 1810. The Columbian (New York, NY). May 12, 1810. Columbian Gazette (Utica, NY). May 22, 1810. The Columbian (New York, NY). June 4, 1810. The Albany Register (Albany, NY). June 19, 1810. New-York Evening Post (New York, NY). June 21, 1810. The Balance, and New-York State Journal (Albany, NY). June 22, 1810. The Advertiser (Ballston Spa, NY). July 10, 1810. Miscellaneous Records of the Town of Eastchester New York, 1794-1834. 111-113.